Welcome to JoaLins Australian Labradoodles! We are a small, family-owned breeder of registered multi-generational Australian Labradoodles. We are dedicated to responsible and ethical breeding practices that produce happy, well adjusted, well socialized puppies that have fantastic pedigrees and are non-shedding and allergy-friendly. We started breeding Australian Labradoodles so we could share these amazing dogs with others and to assist non-profit service dog organizations through our donation of puppies for individuals with disabilities who need a service dog or therapy dog but cannot afford one. We chose to breed multi-generational Australian Labradoodles as these puppies are the result of generations of breeding time and investment. JoaLins Australian Labradoodles breeds multi-generational Australian Labradoodles because of the consistent quality of the puppies' coats, their appearance, and temperament. They have just the right blend of personality and unique characteristics to make the perfect family dog! The multi-generational Australian Labradoodle puppies we produce have the same temperament and traits of the dogs we fell in love with and are the perfect companion for any dog lover – a family, a couple or an individual! Our dogs and puppies are raised in our home, surrounded by love and immersed in all the normal sights and sounds of daily life. Our Australian Labradoodles are our constant companions and receive individualized attention throughout the day. We do not own or operate a kennel for our dogs and never plan to have one. Our home is located on three beautiful fenced acres in the country near Tampa, Florida. Our dogs and puppies have plenty of room to run around and explore to their heart’s content on our private property. Raising and keeping our adult dogs and puppies as family members first - they live in our home with our family and are treated as family companions. Selecting only the “best” multi-generational Australian Labradoodles we can find from throughout the United States to become part of our breeding program. Providing quality care for our adult dogs and puppies – they will receive top-quality vet care, nutrition, and training throughout their lives. 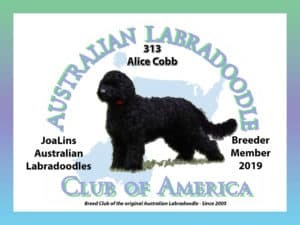 Health and genetic testing of all our multi-generational Australian Labradoodle adults prior to breeding to ensure, to the extent possible, that all puppies born at JoaLins will be sound and healthy. Guaranteeing the health of your Joalins puppy for 2 years against genetic problems that would alter the quality of your puppy’s life. Matching the right puppy with the right family based on answers to our application, screening of each family, and the characteristics and temperament of each puppy. We temperament test puppies at 7 weeks by using the Wendy Volhard Puppy Assessment Test to guide us in the placement of puppies. Providing each puppy with the best possible start in health care, training, nutrition, and socialization. We follow the developmentally appropriate puppy training program called “Puppy Culture”. Puppy Culture is an internationally proven training program developed by nationally recognized veterinarians and scientists. This program is based on using established training procedures and techniques during those first 8 weeks of life which results in well balanced, curious puppies that will become an outstanding pet. Click on logo for more information. We micro-chip, vaccinate (first round of shots), and de-worm all puppies before they are picked up by their new families. We begin house and crate training all puppies before they leave our home. Providing on-going, never-ending support for families and their puppies. Maintaining our membership in and following the standards and Code of Ethics of the national Australian Labradoodle organization. Donating one puppy from each litter to a non-profit organization that trains service and/or therapy dogs for the disabled and our returning veterans. We are proud that we produce happy, well adjusted, well socialized puppies that have fantastic pedigrees. We would love to talk to you and share our passion for these amazing dogs – just email or call us. We think you will fall in love with the Australian Labradoodle just like we did!